Endocarditis is emerging as a significant complication after percutaneous transcatheter pulmonary valve replacement. We report a patient who presented in shock with acute staphylococcal endocarditis 5 years after implantation of a Melody valve. A 17-year-old male with complete transposition of the great arteries, ventricular septal defect, and pulmonary stenosis had previously undergone a Rastelli repair with placement of a 16 mm pulmonary homograft in infancy. He subsequently underwent conduit replacement with a 20 mm aortic homograft at 7 years of age that was then balloon dilated at 12 years of age. A transcatheter Melody valve was placed within this homograft soon after balloon dilatation. He did well for 5 years following Melody valve implantation with minimal gradient across the conduit and no more than mild regurgitation. He presented with a 2 days history of fever, diarrhea, vomiting, and an episode of syncope. On examination, he was pale, febrile, icteric, tachycardic, and hypotensive. Two sets of blood cultures grew methicillin-sensitive staphylococcus aureus. He was admitted to the intensive care unit and resuscitated with intravenous fluids and inotropes (dopamine 5 μg/kg/min). He was commenced on intravenous vancomycin (1 g every 12 h), rifampicin (300 mg every 8 h) and gentamicin (62 mg every 12 h). Subsequently, vancomycin was stopped and intravenous oxacillin (2 g every 4 th h) was started based on the sensitivity results. Right ventricular pressure estimates on echocardiography were initially normal, and increased over the 1 st 48 h of hospitalization to near-systemic pressure. The stent within which the valve was mounted precluded direct visualization of the Melody valve leaflets to assess their motion or examine for vegetations. Cardiac magnetic resonance (CMR) imaging did not reveal perivalvular abscess and was also suboptimal for evaluating the internal anatomy of the pulmonary valve. 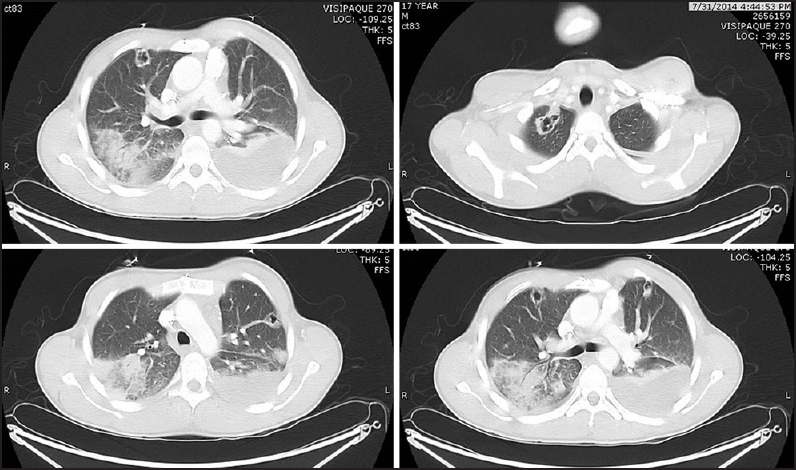 Computed tomography (CT) of the chest showed multiple cavitary nodules of varying sizes throughout both the lungs, most pronounced at the apices, and associated with pulmonary vasculature, suggestive of septic emboli [Figure 1]. His condition stabilized over the next 48 h and he was discharged from the intensive care unit. Gentamicin was stopped after 2 weeks. After 6 weeks of treatment with oxacillin and rifampicin, he was electively scheduled for explantation of the Melody valve. At surgery, there was considerable inflammation around the heavily calcified homograft. The Melody valve was clearly infected [Figure 2]. There was thickening and edema of both the valve leaflets, one of which had adhered to the internal wall of the Melody valve and was immobile. The homograft and Melody valve were explanted and replaced with a pulmonary homograft. Histopathological examination revealed acute inflammatory infiltrate with granulation tissue in the Melody valve suggesting acute endocarditis. The postoperative course was uneventful. The patient is doing well at 6 months follow-up. Currently, the Melody valve is the only percutaneous option available for use in the pulmonary position. Although other homografts and bioprosthetic valves in the pulmonary valve are not entirely free from the risk of endocarditis, the Melody valve seems to be at a higher risk of infection. 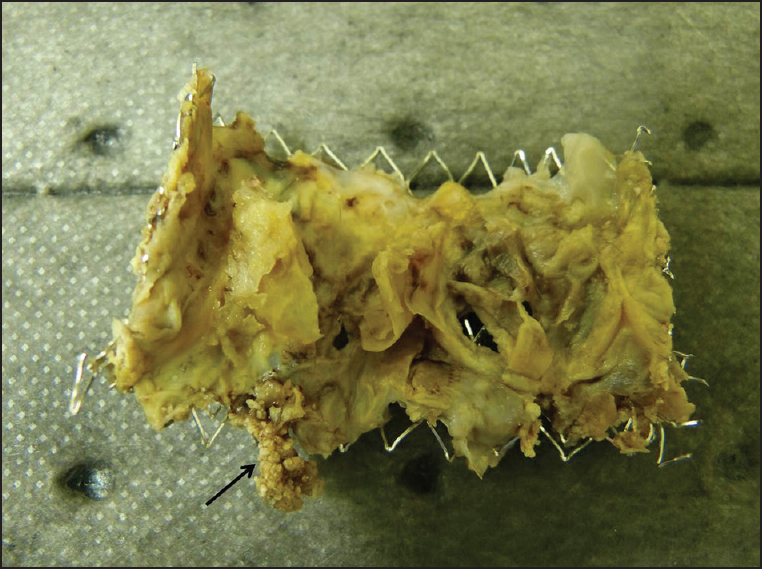 In a recent experience from France, the incidence of IE following percutaneous pulmonary valve replacement was 8.6% as opposed to 2.6% following surgical pulmonary valve replacements. In this study, a history of prior endocarditis was the only factor significantly associated with endocarditis of the percutaneously placed pulmonary valve. In contrast, the Italian registry identified male gender, previous endocarditis, prior stent implantations in the right ventricular outflow tract (RVOT) and altered RVOT anatomy as factors significantly associated with IE of the Melody valve. The "cheese-grater" effect of the metal stent immediately adjacent to the BJV valve in the Melody implant may contribute to the high susceptibility to endocarditis. Variations in the geometry of the conduits into which the Melody valve is deployed causes irregularity in the geometry of the implanted valve. This gives rise to potential spaces and pockets that can eventually facilitate the development of infection. This risk seems to be particularly higher in patients who have stopped antiplatelet therapy. , Interestingly, the French study also revealed that surgically implanted BJV valved conduit (Contegra-Medtronic Inc., Minneapolis, MN, USA) is also associated with a higher risk of endocarditis as compared to homografts and other alternatives. It has therefore been speculated that the "inherent biological characteristics of the BJV and its method of preparation may be contributing to the possible thrombosis and tropism for microorganisms." The coapting surface of the Melody valve also tends to be long and the resulting redundancy of the valve leaflets may also predispose to infection. However, none of these theories have been conclusively proven and further evaluation is necessary to completely understand the patient and prosthesis related factors predisposing to infection and carry out necessary modifications in design if necessary to ameliorate this risk. Infective endocarditis of the Melody valve is a relatively recently described and potentially morbid complication following percutaneous pulmonary valve replacement. It manifests as an acute life-threatening febrile illness and is associated with significant mortality. A high index of suspicion is required to diagnose this condition in view of the limitations of standard imaging modalities in evaluating the stented prosthesis. Future directions include further elucidating the patient and prosthesis related factors predisposing to infection and making appropriate changes in prosthesis design and/or patient selection to reduce the risk of infection. Bhat DP, Forbes TJ, Aggarwal S. A case of life-threatening Staphylococcus aureus endocarditis involving percutaneous transcatheter prosthetic pulmonary valve. Congenit Heart Dis 2013;8:E161-4. Butera G, Milanesi O, Spadoni I, Piazza L, Donti A, Ricci C, et al. Melody transcatheter pulmonary valve implantation. Results from the registry of the Italian Society of Pediatric Cardiology. Catheter Cardiovasc Interv 2013;81:310-6. Villafañe J, Baker GH, Austin EH 3 rd , Miller S, Peng L, Beekman R 3 rd . Melody pulmonary valve bacterial endocarditis: Experience in four pediatric patients and a review of the literature. Catheter Cardiovasc Interv 2014;84:212-8. Malekzadeh-Milani S, Ladouceur M, Iserin L, Bonnet D, Boudjemline Y. Incidence and outcomes of right-sided endocarditis in patients with congenital heart disease after surgical or transcatheter pulmonary valve implantation. J Thorac Cardiovasc Surg 2014;148:2253-9. Jonas RA. Endocarditis and the transcatheter pulmonary valve. J Thorac Cardiovasc Surg 2014;148:2259-60. Cheung G, Vejlstrup N, Ihlemann N, Arnous S, Franzen O, Bundgaard H, et al. Infective endocarditis following percutaneous pulmonary valve replacement: Diagnostic challenges and application of intra-cardiac echocardiography. Int J Cardiol 2013;169:425-9.